Reviewing the best mobile craps apps for android phones and tablets. If you’ve been reading this blog for any length of time now, you probably know I’m not the ‘one and done’ type. 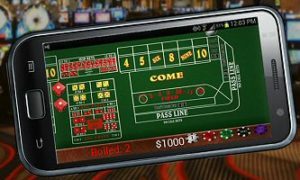 Having been asked several times recently, ‘What’s the best way to learn to play craps?‘, I decided to check out the top free craps apps on Google Play and see which one really is the best. Not necessarily the most entertaining, or the easiest to play, but the best at teaching players the fundamentals of the game. I began with the highest rated Craps apps on Google Play, then moved on to mobile Craps games specifically designed for learning how to shoot dice. My intention was to find the best training app. What I discovered was two very different craps mobile games that both qualify as top-of-the-totem-pole; at least, in my book. 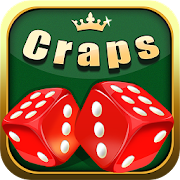 First, I present the top craps mobile app for experienced players who already know the ins and outs of the game, and are looking for solid entertainment. Next up is our #1 pick for learning to play the game, and practicing various strategies. This first game is called Craps – Casino Style. It’s developed by Phonato Studios. I chose to start here because it’s got the highest user rating on the Google Play Store, receiving 4.5 out of 5 stars with over 500k downloads and 3,300 reviews. It’s a single-player game—man vs. house—and as expected, the graphics are excellent. As you’ll see from the pros/cons below, it’s a stellar choice for veterans who already know and love the game, but fails miserably as a craps training app. Pros: The game itself is aesthetically pleasing and runs smooth. I experienced no glitches or lag, and the layout is exactly as it should be. Playing couldn’t be more simple. Choose a coin size and tap the betting area to place a bet. All the usual wagering options are available, including up to 5x odds. Cons: This app will not teach you how to play craps; at least, not anything beyond Pass Line and Come bets. In doing so, there’s a lot left to be desired in the grammar department. These are just annoyances, though—nothing detrimental to the overall experience, so long as you already know how to play. Our Rating: As a training app, we give Craps – Casino Style just 2 of 5 stars. This is not a good choice for beginners. However, it’s a great deal of fun for experienced players. Grading on functionality and entertainment value, we raise the bar to 4.3 out of 5 stars. 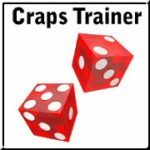 Next up is a mobile app called Craps Trainer Free (as opposed to Craps Trainer Pro, the $4.99 edition), by E7Systems. This one only has 3.7 out of 5 stars on the app store, with over 100k downloads and about 1,500 reviews. If you’re a beginner player with a desire to learn, I’ve found nothing better on the app store. Pros: The game launches with a pop-up window describing how to place bets (tap and drag chips), and how to get advice on each type of bet (tap the betting area). This is extremely helpful in understanding the game’s functions. Whenever a bet wins or loses, a screen pops up detailing the bet, type, amount wagered, odds and result (win/loss amount). The game also offers advice when placing certain bets. For instance, players are praised for “correctly” betting max odds on a Pass Line bet. When wagering on Place 6 after the shooter rolls a Point of 6, you’ll be advised that the payout is 7:6, and to place your bet in increments of $6. Click on the menu and choose Game Statistics to see how you’re doing so far. You’ll see how many bets you’ve won, how many you’ve lost, and the average rolls per round. This is great for players learning the ropes, and practicing craps strategy. To reset the statistics (handy for judging your progress), go into your device Settings > Apps > Craps Trainer and clear the Cache. Cons: I noticed a lot of complaints about this, and low-and-behold, it can be a real problem. As soon as the shooter rolls 7s and you crap out, the game may crash. However, others complained that all bets were reset. In my case, tapping ‘Restart App’ following a crash brought me right back where I left off, with all bets still on the table—as if the 7 never rolled. In my experience, the crap-out-crash happens about 33% of the time. It’s annoying, but with so many pros, I wouldn’t call it a deal breaker. 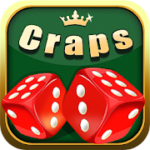 Our Rating: As a training game, this is by far the best mobile craps app for android, worthy of 4.7 out of 5 stars; the only drawback being the occasional crash. As for veteran players seeking a fun game, I have to agree with other reviewers, awarding only 3.5 out of 5 stars. Side Note: The $5 version of Craps Trainer Pro has received a more recent update than Craps Trainer Free. According to its developers and multiple updated user reviews (I haven’t tried it myself), crashing is no longer an issue in the paid version. If you’re really committed to learning, practicing and developing strategies, it may be worth the extra $5.